KeyedIn Projects is a cloud-based project management suite that can help organizations and professional services companies improve everything beginning from project initiation all the way to execution by administering programs that are based on top-line strategy as well as delivering profitable projects. It offers greater flexibility and scalability for businesses, delivering a measurable and better return on investment months or even years ahead of on-premise platforms. It is offered as an SaaS (Software as a Service) model, making its platform affordable for every budget. KeyedIn Projects is designed to give businesses the very best of both worlds: execution-driven and strategy-led. KeyedIn Project is an efficient and fully integrated suite of project management platforms that accelerates your company’s everyday tasks including project planning, task allocation and scheduling, and budget management. In addition, it simultaneously provides the rich management information you need for your business to support effective program, project, and portfolio management. 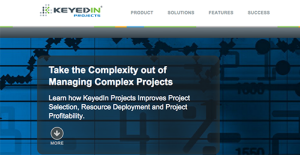 KeyedIn Projects allows you to take the complexity out of handling complicated projects. It was created to leverage true SaaS-based technology to get better business results, KeyedIn Projects was build completely for the cloud. It is browser agnostic and provides mobile access using iOS and Android devices. Through its approach, the tool can provide you with a highly cost-effective, configurable, rapidly deployed project management tool that gives a unique chance to provide fast results, and boost your investment. It enables agility, scalability, and accessibility using a true and multi-tenant SaaS architecture. It will also let you deliver enhancements quicker, and to all clients at the same time — with a drastically reduced total cost of ownership. In addition, customers have the capacity to configure applications to match their business needs. KeyedIn enables an organization to squeeze a competitive advantage out of its people, programs, portfolios, projects, products, and processes. It is a supremely flexible application that lets you manage programs, projects, and entire portfolios better. It is a single, all-access platform that gives a comprehensive and easy view of the status of your project. Since each company has unique business needs, it is prudent for them to refrain from looking for a one-size-fits-all ideal software solution. Needless to say, it would be pointless to try to find such a system even among widely used software applications. The clever thing to do would be to catalog the various important aspects that need consideration such as required features, finances, skill levels of staff members, company size etc. Then, you should do your homework thoroughly. Read some KeyedIn Projects reviews and look into each of the other systems in your shortlist in detail. Such comprehensive homework can make sure you weed out ill-fitting systems and select the solution that provides all the aspects you need for business success. How Much Does KeyedIn Projects Cost? We realize that when you make a decision to buy Project Management Software it’s important not only to see how experts evaluate it in their reviews, but also to find out if the real people and companies that buy it are actually satisfied with the product. That’s why we’ve created our behavior-based Customer Satisfaction Algorithm™ that gathers customer reviews, comments and KeyedIn Projects reviews across a wide range of social media sites. The data is then presented in an easy to digest form showing how many people had positive and negative experience with KeyedIn Projects. With that information at hand you should be equipped to make an informed buying decision that you won’t regret. Great tool for managing your business. great platform for managing time, projects and tasks. What are KeyedIn Projects pricing details? What integrations are available for KeyedIn Projects? Pros: What’s most important for me is that the software is easy to use, and it is very intuitive and customizable. We are able to create our own reports and dashboards. The keyedin provides us with tools for Risk and Issue management, as well as tools for Action and tasks Management. Cons: I need to say that widgets are little complicated to create. Also, finance and forecasting tabs are limited. Pros: With user logins and profiles we can easily break out groups based on permission, also the report features gives us detailed analytics and insights based on provided data and project details. Cons: This system requires lot of configuration in order to run properly. You need to know how to run this software successfully, otherwise small errors will make troubles and are difficult to diagnose or fix without calling their support team. Flexible and intuitive system to keep track of all our projects and tasks.